Cranbrook was described by its original builder as “a twig off a branch”, although while the HWLR line from Hawkhurst to the branch terminus would have been short it probably wouldn’t have been straight. Driving between the two towns last weekend, I started to think about how the route might have fitted into the landscape of the Weald. Coincidentally I had also recently found a great online resource of Ordnance Survey maps to pore over. 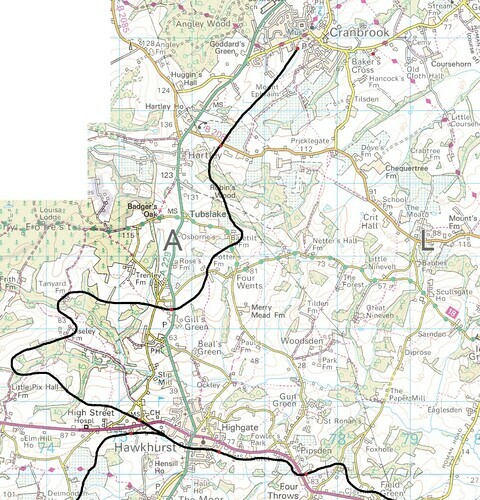 For those who don’t know the area, immediately north of Hawkhurst (around 70m above sea level) there is a steep-sided valley descending to 40m, and on the far side beyond Gills Green the land then rises up to over 130m – so the A229 road is a bit of a rollercoaster. Obviously even a narrow gauge light railway couldn’t follow these kind of gradients, so my projected HWLR follows the contour lines and wiggles off the west through the wooded hillsides to eventually curve back and meet the A229 at a halt a Gills Green. This was actually the location of Hawkhurst station on the (real!) standard gauge branch from Paddock Wood, which would have left passengers with a long, steep walk to town. After this the line has little choice but to climb roughly in parallel to the road up to a ridge of around 100m above sea level and cross it at Hartley, where there would be another halt. Hartley was also the location of the real “Cranbrook” station, sited to the west of the A229, although it was over two miles from its namesake town. We can do better! Following the summit point of the branch, the route then drops fairly steeply down into Cranbrook itself to around 75m elevation. For the time being I have placed the HWLR station on an empty spot close to the centre of the town in such a way that it more-or-less fits in with the layout’s backscene, although a site visit in future might lead to a few tweaks. This entry was posted in cranbrook, narrow gauge, planning. Bookmark the permalink.